Accommodation Zugic i Zabljak, Montenegro : Boka nu! In the accommodation Zugic you can be assured of friendly personal service and an enjoyable stay. You can prepare your own meals in the private kitchen. Breakfast is available on request. Free WiFi, Cable TV and parking. 300 meters from Bus Station. There are numerous hiking paths and opportunities for mountain climbing in surrounding region. Very near are beautiful Black Lake and National park Durmitor. Rafting is possible in marvelous canyon of Tara river about 25 km from our accommodation. We will provide hiking maps and drive you to the starting points of most spectacular hikes, advice you about best restaurants and places in Zabljak, organize rafting, canyoning and horse riding tours on your request. We are located right in the city center, 300 m from Bus Station, down to main street. 100m from Taxi station. 170 km from Tivat Airport. 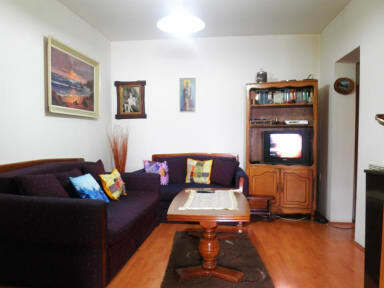 Main apartment contains vestibule, 2 bedrooms, comfortable living room, modern and always clean bathroom, free cable TV. All other apartments have modern furnishings.Every apartment has living room, kitchen,bathroom, window,brand new beds,closet,city center or garden view. Bathrooms are spacious. Accessories and fittings are modern and fully functional. Accommodation Zugic Policies and Conditions. Breakfast not included - 4 EUR per person per day.